Lose weight for life! Don’t just diet then worry about keeping the extra pounds off, when you can master weight control for life with these 10 Daily Habits. 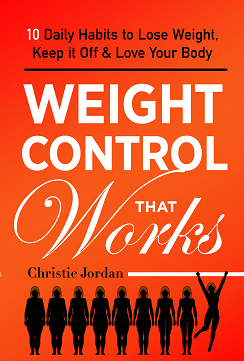 This unique guide is packed with practical advice for controlling your weight from someone who really knows. Christie Jordan lost 85 pounds by changing her lifestyle, and now, twenty years later, the lost weight is still history. In Weight Control That Works, she explains how you can banish extra pounds permanently, and patiently walks you through the lifestyle changes which will support your good health. Put an end to yo-yo dieting. Understand why diets are an unsustainable intervention in your regular life. When your normal life doesn’t support weight control, the pounds will come back. Discover why sleep is so important, and how lack of sleep influences your willpower and the hormones regulating your appetite. Learn up-to-date nutrition advice and why knowing how your metabolism works matters for keeping pounds off. Understand why eating sugar in the morning is a bad idea, and why protein is a better breakfast choice. Learn how eating sugar affects your brain’s ability to resist sweet foods. Take control of your food cravings with effective techniques. Get recommendations about calories, carbohydrates, fiber, and fat. Learn what to stock in your kitchen, how to prepare healthy snacks, and meals for breakfast and lunch. See why avoiding refined white flour is a key factor in maintaining a healthy weight. Go behind the scenes to learn more about how packaged food is produced and marketed to you. You’ll see why high-fiber whole grains are the best choice to keep the pounds off. Understand how portion control and exercise are vital to your success, and find new encouraging ways to make it happen. Learn why enjoying your body and getting pleasure from all your senses is very important for maintaining healthy weight. The 4 Week Program for Learning the 10 Daily Habits comfortably and successfully. Additional Bonus Habits to support your continued success.